National Security Council chief Chung Eui-yong and National Intelligence Service chief Suh Hoon could visit North Korea once more before the inter-Korean summit on April 27, presidential Chief of Staff Im Jong-seok said Tuesday. It seems the two sides have trouble ironing out disagreements over the agenda after several rounds of working-level talks. Chung and Suh went to Pyongyang in March as special envoys of President Moon Jae-in to arrange the summit. Im told reporters a hotline connecting the leaders of the two Koreas should be set up around Friday, and a test call could take place at that time, but it remains unclear when the two leaders will actually speak on the phone. Im stressed the significance of the summit taking place at the border truce village of Panmunjom. 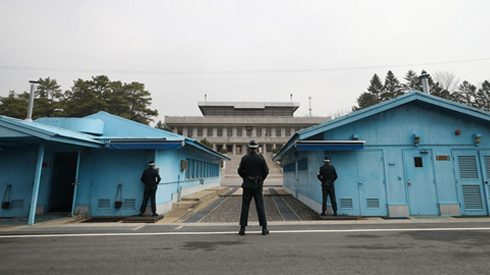 "It is significant that the leader of the North is visiting the South Korean side" of Panmunjom, he said. "If the summit produces good results, both sides could meet there on a regular basis." He said the focus of the summit "will be the complete scrapping of North Korea's nuclear weapons, the establishment of a permanent peace framework, and improvements in inter-Korean relations." Asked if North Korean leader Kim Jong-un's wife Ri Sol-ju will attend, Im said, "We hope she will come, but it is uncertain at this point." Cheong Wa Dae also voiced hopes that the U.S.-North Korea summit will be held in Panmunjom. A senior Cheong Wa Dae official said, "If it takes place in Panmunjom, it would carry far more symbolic significance that the [1989 U.S.-Soviet Union] summit in Malta." But he admitted that this is "an area of negotiation between the U.S. and the North. The U.S. and North Korea continue fine-tuning plans for the summit, but there are not that many options so Panmunjom or even Jeju Island are both possible." Washington on Tuesday said five locations are being considered for the summit. U.S. President Donald Trump told reporters "very high levels" of discussion between Washing and Pyongyang are already underway. "We have had direct talks," Trump said. The Washington Post said CIA Director Mike Pompeo "made a top-secret visit to North Korea over Easter weekend as an envoy" for Trump to meet with Kim.